From the DVD's Main Menu go to the 'Bonus Features' section and there select the menu entry for the 'Alternate Opening.' Now press the 'Right' arrow key on your remote control followed by the 'Down' arrow key. This will highlight one of the bolts on the wheel and give you access to a clip showing preproduction artwork for some of the movie's characters. Select the 'Backstage Disney' menu entry. 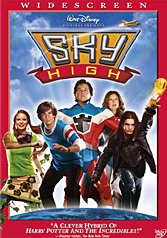 Once there, highlight 'Welcome To Sky High' and then press the 'Right' arrow key on your remote control, followed by the 'Down' key. This will highlight the guinea pig on the right side of the screen, below the school bus window. Now press 'Enter' and you will see a clip about how hard it is to find a good guinea pig actor. From the disc�s Main Menu and highlight the 'Scene Selection' menu entry. Press the 'Right' arrow key on your remote control, followed by the 'Down' and the 'Left' keys. This will highlight a circle in the dashboard of the bus and give you access to a storyboard version of the cafeteria fight scene, which was part of the original pitch of the idea by the filmmakers to the studio. 2. move the selector around until u have an arrow beside "Sneak Peeks"
3. hit the "right" (>) button on your remote for moving the selector - the selector seems to disappear from the menu. 5 hit the left button - you should notice one the gagues is selected now. 6 hit the center or "enter" button.